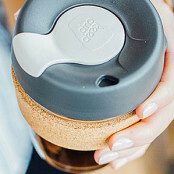 The first barista standard reusable coffee cup - KeepCup will replace those disposable cups, they are a simple, handy way to enjoy your favourite Suki Tea (or coffee) wherever you are! This small KeepCup has a capacity of 227ml/8oz. Australian Company KeepCup is leading the march to ditch disposable cups - listed as Independent "Best Buy" 2018. Made from fully tempered soda lime glass, the KeepCup Brew Cork Edition features a natural cork band. Made in Portugal using waste product from the wine cork manufacture, the band is beautiful to hold. Have you got one yet?? Service rating : Delivery took a little long but they have amazing customer service. Service rating : Item arrived promptly. Mildly irritating that the package needed signing for so it ended up at the post office rather than left by the door - not a high enough value item to justify this level of security. Product : Owned one before that got lost. I use mine on my commute and... Service rating : Item arrived promptly. Mildly irritating that the package needed signing for so it ended up at the post office rather than left by the door - not a high enough value item to justify this level of security. Product : Owned one before that got lost. I use mine on my commute and when working in the office to reduce the amount of disposable cups I use. Design is functional and aesthetically pleasing. Good product! Works well, very happy. Service rating : The keepcup I ordered was the best price by far, perfectly packaged and arrived really quickly! I would definitely recommend and would order again in the future!! 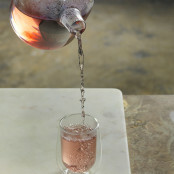 Product : Fab little cup!! Bought as a gift for my husband who loves it! !